Throughout the last five centuries, Africa has existed in the Western imagination between two polarized extremes. One is the Africa that exists as treasure trove of spoils, a source of slaves to take as free labor, and a vast land full of natural riches for the taking. The other extreme is the Africa that is in need of saving, a place of needy and helpless souls where Westerners can live out their fantasies of missionary heroism. However, in the dawn of the twenty-first century, a different African story has emerged which is, and should be, challenging the way that the West imagines Africa. From Nigeria to Kenya, and from Angola to Ethiopia, Africa is now one of the engines of global economic growth, clocking in over 4 percent annually. Instead of a continent in need of saving, Africa is becoming the next great frontier for development and economic opportunity. For the West to take part in this new African story, it is crucial to build a new relationship with Africa. Ever since the first Portuguese ships began to ply the shores of sub-Saharan Africa, the “dark continent” has existed in the Western mind as a passive, helpless entity. The first several centuries of widespread contact coincided with the European age of discovery and industrialization, both events spelling great suffering for the peoples of Africa. As Europeans colonized the New World, the need for a vast and compliant labor force drew them to West Africa, an easy source for slaves as the region had been practicing the institution of slavery for hundreds of years. From the sixteenth century to the nineteenth century, tens of millions of Africans would eventually be brought to the New World and dehumanized by a racialized institution of slavery, creating a major modern diaspora that is culturally disconnected from its origins. As competition flared between great European powers, Africa became a boundless source for colony grabbing. The “Scramble for Africa” culminated with the Berlin Conference of 1884, where Africa was divided as bounty and the institutions for wholesale European colonization for Africa were formalized. In 1870, only 10 percent of Africa was colonized. By 1914, over 90 percent of the continent’s landmass, with the exception of Ethiopia, Somalia’s Dervish state and Liberia, was under European control. With colonization also came religious missionaries, who saw themselves as generous and enlightened saviors doing God’s work by saving the heaving masses of heathen souls. This well-meaning but ultimately misguided and self-righteous attitude was captured in Rudyard Kipling’s poem “The White Man’s Burden,” describing the West’s attitudes towards its colonies. In postcolonial Africa, Western imagination and intervention through humanitarian aid and the presence of Western NGOs have continued this legacy of missionary zeal and the attitude that the West, without input from Africans themselves, understood what is best for Africa. As Western nations matured through centuries of social upheaval and evolution to become more humane and comfortable societies, the image of Africa evolved from a place to be looted to a place of misery where Western man could live out his savior fantasies. With the political instability and ensuing chaos and mismanagement that followed decolonization, the image of famines, genocide and helpless Africans became ingrained in the Western imagination. Though the image of Africa transitioned from bounty to be seized to that of an eternal victim, one thing remained constant: the passive nature of Africa’s place for the West to make its mark and bestow civilization. In 2000, the Economist ran a cover story, “The Hopeless Continent,” which argued the thesis that Africa was beyond help, and doomed to a future of barbarism and underdevelopment because of its poor social institutions and corrupt governance. A few years later, this story line would face a complete rebuttal as the continent became central to the strategic interest of a rising superpower from the east: China. Although China had established diplomatic ties with a wide number of African nations, and even participated in aiding anticolonial struggles in the continent since the fifties, its presence on the continent had largely been minimal. 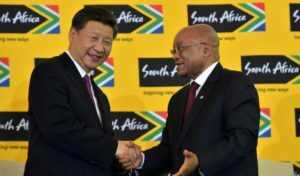 However, at the onset of the twenty-first century, China, experiencing the throes of the most massive industrialization in human history, began to identify Africa, a continent full of natural resources, commodities and a vast untapped market, as a place of great long-term strategic value. Using a diverse arsenal of tools, from increasing trade, investment, loans and infrastructure aid, China has emerged as the dominant foreign power in Africa, and as a favored partner for African countries looking to emulate its rapid development. From a negligible trickle in 2000, China’s trade with Africa topped $160 billion in 2015, ranking as far and away the largest trade partner with the continent. In 2014, China signed more than $70 billion in infrastructure contracts in the continent, and Chinese banks now provide more loans to African nations than does the World Bank.